Last night, Saturday May 21, the Vancouver Public Library celebrated the 16th anniversary of its iconic Central Branch building by Moshe Safdie . 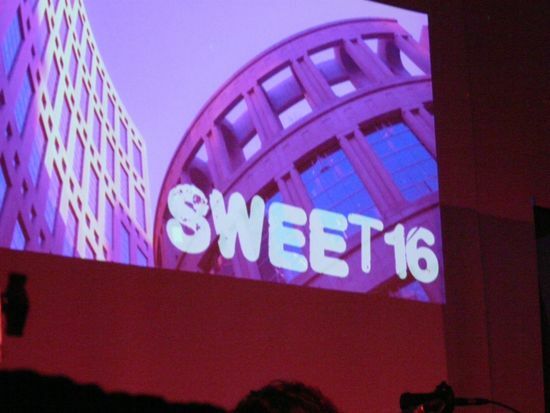 The event was billed as the Central Branch’s “Sweet 16” party. I went to the event with my daughter Malli who thought it was “good”. What’s not to like, there was a candy buffet and Malli was able to fill up her pockets with candy to “share” with her sister. There were loads of kids there with their parents and many friends of the library dancing to the band ESL. Councilor Ellen Woodsworth was Deputy Mayor of Vancouver and she did the opening remarks. The Chair of the Library Board Catharine Evans was there and I had the opportunity to meet Chief Librarian Sandra Singh. Patsy George, who was on the board of VPL when the Central Branch opened, a recipient of the Order of Canada and noted human rights activist, was also in attendance at the party. Tagged with: Catharine Evens, Ellen Woodsworth, ESL, Patsy George, Sandra Singh, VPL.